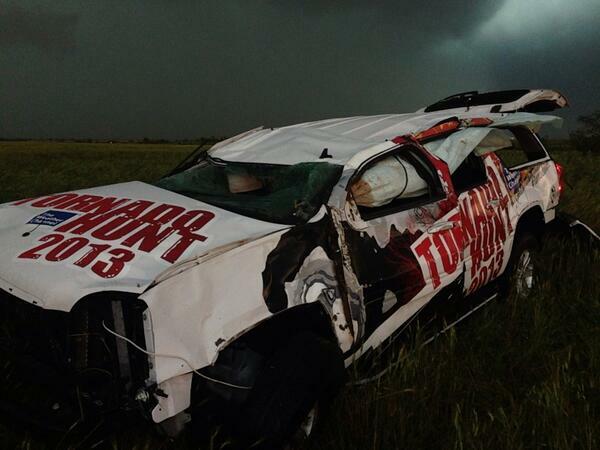 The Weather Channel Tornado Hunt Team is safe, but shaken up after their chase vehicles took a direct hit by a violent tornado west of Oklahoma City. Meteorologist Mike Bettes was chasing the monster rain-wrapped tornado near El Reno, Okla. when he says the storm picked up the heavy chase SUV and threw it an estimated 200 yards. These three were not so lucky. How sad but they died doing what they loved. When I saw who it was I was amazed - these guys seemed so cautious placing their probes and getting to a safe distance. Seems like no matter how much we know we will never know enough. so sad for the Samaras' and Carl Young who was killed I was watching TWC as it happened as I was with the Moore,OK twister it just turned on a dime and barrel rolled them.